With a large menu, big bar and plenty of seating, C.J. Muggs, at the corner of Lockwood and Gore avenues in Webster Groves, feeds and entertains locals and newcomers en masse. The menu features expected and unexpected bar fare, including Bayou shrimp sautéed in a beer-and-butter sauce, three-bean chicken chili and Creole gumbo. C.J. Muggs also serves an expansive selection of pizzas, baked with both mozzarella and Provel cheeses. Some of the restaurant's heftier bites include entrées, burgers and sandwiches, including a bourbon pepper steak, seared and topped with a sweet onion bourbon sauce and onion strings, a barbecued pulled pork sandwich and the "St. Louis Bleus" burger topped with blue cheese and bacon. Local musicians rock out on a corner stage, and after a few beers, you'll be waving your lighter in the air with a group of new best friends. C.J. 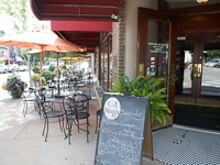 Muggs also offers patio seating along the sidewalk, and the Webster Groves location houses a large private banquet room. Extra Info: Sunday Brunch 11 a.m.-2 p.m.